Tribute to Narain Kataria. Freedom Fighter against Islam, for Hindus, for India, for Israel, for human rights and freedoms for the entire world. for human rights and freedoms for the entire world. A notice came into my inbox yesterday, November 5th. Narain Kataria has died. I want you to know of his death, his passing. More, I want you to know, if you don't already, of Narain, who spent the last quarter century of his life, his "retirement", as a passionate freedom fighter for Hindus worldwide, for India, for all who suffer from Islamic terrorism. I learned so much in my interview with him - so much that was concealed by the few bland words in a history textbook: "India was partitioned in 1947." I can think of no more fitting tribute to Narain than sharing a little about this warm, caring, dedicated human rights activist. And at the end you will find the other tributes that have come in. How did I ever hear of him? I'm not sure. Somehow or other I got on his list a couple of years ago. Through that, I came to a lot of information I wasn't getting from other sources, on India, especially. When I was thinking, mid 2014, of whom to interview, he came to mind. I'm grateful he agreed to the interview. "There is no such a thing as a “War on Terror” because terrorism is only a technique, a tool, a tactic in a much larger war - Universal Jihad. Universal Jihad is a threat to the entire free word, and it is a war that can be won only if we acknowledge that it’s a war against humanity." PPS. I also received a couple of emails warning about some of the groups Narain was associated with, which are not only pro-Hindu, but for instance, linked with attacks on Christian churches in India. This raises an important question: what to do with destructive elements in a group, and also destructive aspects of a group? But I will keep this as a tribute to Narain Kataria, warm and caring freedom fighter. I could not believe the news about the demise of Shri. Narain Kataria Ji and hence waited till confirmation from his close circles. He is/was a true Valiant Hindu DharmaVeer (Fighter for Dharma). He is a Big Loss for Hindu Dharma. He was fearless and always inspiring the new generations like us!! I doubt he ever tired!! He was always in Action! He will take PunarJanma (Re-Birth) and would join the forces against 1s1amik Jihaad and would successfully defeat them, I am sure. Hence, Hindus and all the forces against 1s1amik Jihaad for that matter should join hands and try to work on the wish of Narain Ji. That will be a 'True Tribute' to him !! Please Read: The Muslim Jihad Against Hinduism, by Narain Kataria (Link - http://pamelageller.com/2013/06/the-muslim-jihad-against-hinduism.html/). Above all, stand up the way he did. Speak unwelcome and unpopular truths the way he did. Become an activist and a freedom fighter, the way he did. It's a personal loss. An irreparable loss for all of us. He was a fatherly figure to me. He used to infuse inspiration over the telephone to me. He used to inquire about the plight of helpless and hapless Hindus in West Bengal under Mumtaz Begum's (Mamata Banerjee's) Muslim appeasement policy. He used to ask me about Tapan Ghosh. I felt ashamed when I compare his age and action with that of mine. He was a tireless maverick monk, a missionary for the Hindu cause. I have no words to express my grief at his passing away. He used to send every morning some important message for us all. I will not see them any more from my Hero Narain Kataria-ji. The world is awaiting the apocalyptic catastrophe from Islamic jihad. I can hear the war cry, the shrill cry of gang-raped women and children. I can see the abominable monsters with bare teeth and nail. As long as Koran, Hadith, Sharia and Islam remain on Earth - there will not any lasting peace. Robert Spencer and Dr Bill Warner have done a lot to make people aware of the naked Truth of Islam. Tender my regards to them. 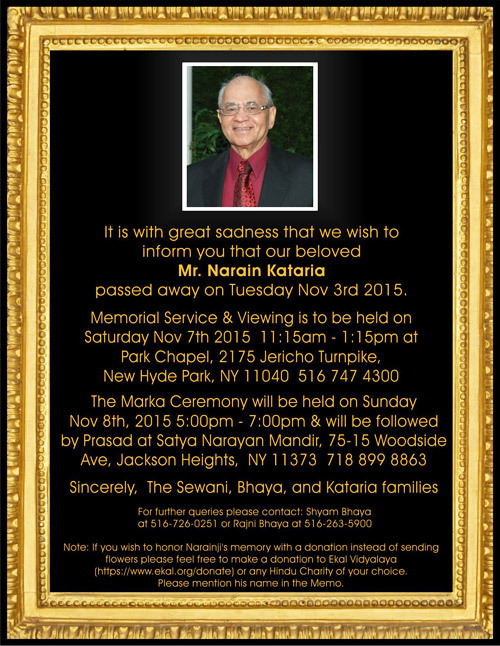 Please accept my sincere condolences for the passing of Narain Kataria. I met him a few times at Act For America. I loved and respected him very much. Surely this is a tremendous loss for the free world. Please forward this message to his friends and family. Elsa, thank you for sharing as I had not heard about the passing of Narain. I had the honor of meeting Narain when he (and a few of his friends) attended several meetings of my local NJ Chapter of ACT for America. He traveled to NJ from New York to attend our meetings. He shared many stories of his experiences and enlightened our group about India, Pakistan & the threat of radical Islam. With deep sorrow I report the passing away of Narain Kataria, tireless fighter in spreading the message of threat of radical Islam around the world, a fighter for Hindus (himself a survivor of radical islam brutality in Pakistan), a friend of Israel who said that Israel is the first gate that world need to protect from radical Islam and if Israel is lost the free world is lost. He spoke in many events in support of Israel. His funeral details are below. It will be held tomorrow (Saturday, Nov 7th) at 11:15 AM to 1:15 PM at Park Chapel, 2175 Jericho Turnpike, New Hyde Park, NY 11040, Ph: 516-747-4300 (funeral home number).